A few more this month, maybe because I had a couple of days off sick… and The Mister has downloaded loads of rubbish chick lit onto my Kindle! I really enjoyed the two books by Jennifer Worth that I read. Her observations about nursing in the East End of London were fascinating. 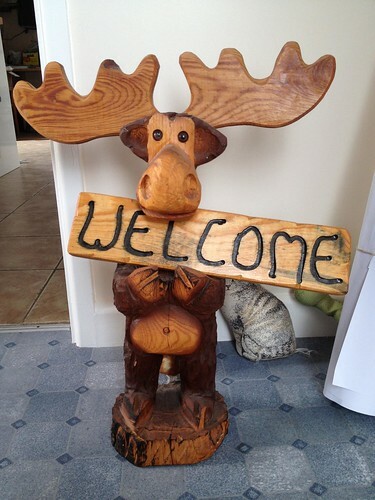 As you walk through the back door of my parents house you are greeted by this wooden moose. I think the other side of the board says something like “Wipe Your Hooves”. Mum and dad went on holiday to Canada and somehow they managed to squeeze it into their suitcase. It is just one bit of many types of holiday tat there are to be found around the house – at least it isn’t a raffia donkey I guess! She has recently had a lovely new kitchen fitted, so her shed is now her jam and chutney making kitchen. It means she can come out here and keep all the strong smells out of her new kitchen. She wouldn’t want to sully such a shiny new kitchen after all! 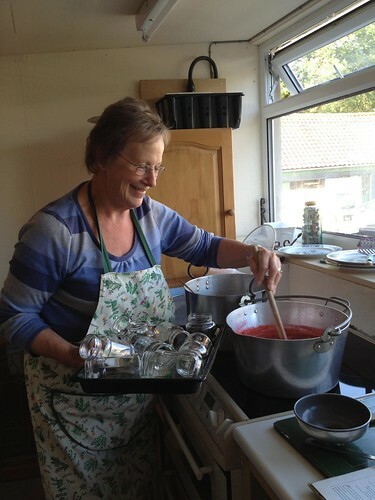 In this picture she is multi-tasking having just taken all the jam jars out of the oven, and she is also trying to stir the strawberry jam. She is a bit of a legend really, and like one of my three Mums. I am very lucky to have so many mothers! Well, this is my favourite picture of the year so far! This is the picture that I have wanted to be able to post for some time but wasn’t sure if I ever would be able to. 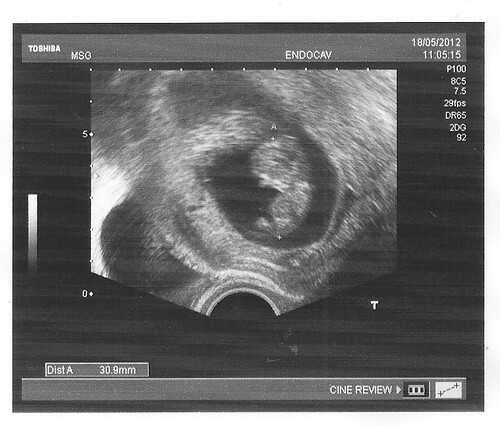 I am very happy to announce that The Mister and I are expecting a baby, due sometime around 16 December. As anyone who has followed this blog, or who knows us will know this has been a hard baby win. Months and months of trying, hoping and then disappointment. Finally an investigation or two followed by a round of Clomid seems to have done the trick. No means has it been an easy few months though as I have had several episodes of bleeding, however, all looks good so far. No-one told me that you needed nerves of steel to get through the first trimester. It has had some unbelievably scary moments and I am still holding my breath and hoping that nothing else is going to go wrong. I still really feel for my friends and family who are trying to get pregnant and who have not got there yet. The one thing I do know is that we have been lucky (so far) and I hope that we will continue to be so, but no-one knows what might happen. If you are able to celebrate with us, then please do, if this news brings you sadness then I also understand that. It’s an emotion that I understand all too well and I recognise that time and space, whilst it doesn’t make it less painful, it does become ‘old news’ and is easier to hear. Thankyou to everyone who has prayed for and crossed fingers with us. Your thoughts and prayers are gratefully received and I hope you will continue to remember us in your prayers. Today I had to go to Jersey to visit the rehab. It was such a beautiful day again. Hot and sunny, the perfect day to catch a flight over to our neighbours. 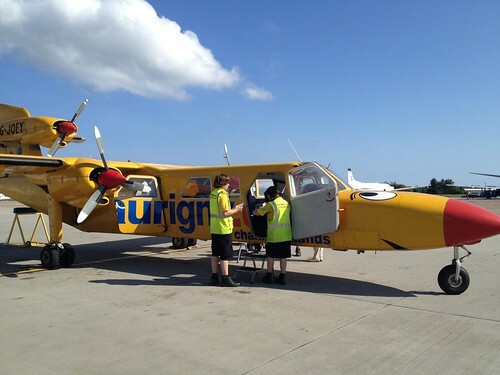 I flew on a Trislander which is 15 seater plane with one captain and in Guernsey we call them ‘flying coffins’. Having said that, the view was absolutely beautiful and the islands practically sparkled beneath the plane. On my return flight I was absolutely delighted to be able to fly on Joey. I slightly embarrassed myself as I literally gasped as I walked out of the airport terminal, unfortunately the rest of the passengers were men in suits who seemed rather nonplussed by the excitement of flying on Joey! 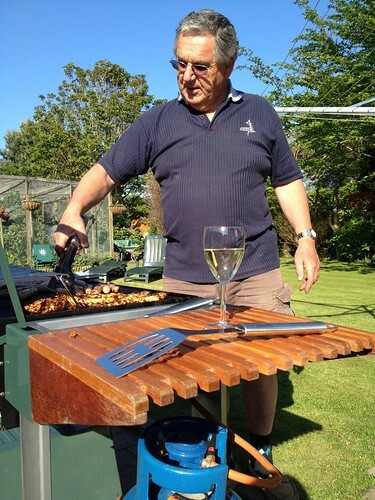 Another gorgeous sunny day and the decision was made to barbecue. 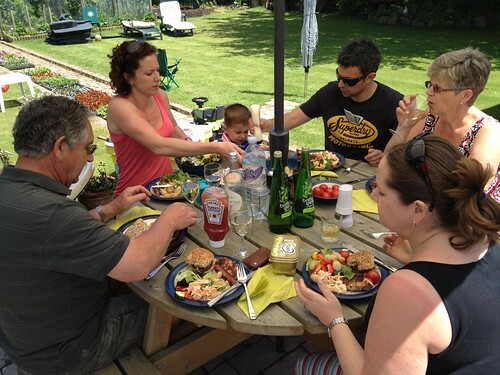 Usually Sunday lunch consists of a roast dinner but there is nothing better than sitting out in the garden, eating barbecued meat and fresh salad and drinking wine. I am holding out that this is the start of a long, hot summer. What are the chances? 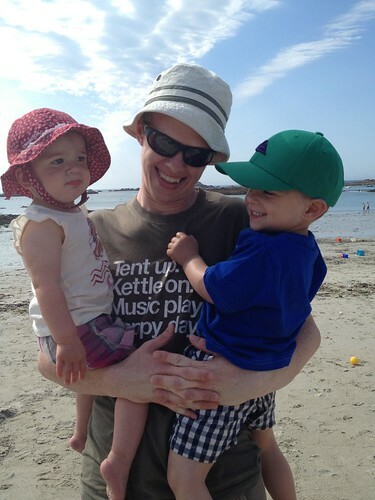 This afternoon we went to the beach with my sister and our niece and nephew, Eden and Barnabas. I have to admit that living back in Guernsey is bliss at times! The ability to go to the beach on a nice day and to sit there and watch the world go by is just lovely. My relationship with my sister has improved immensely since we moved home and it is just a pleasure to be here. I know that sounds smug, but it was a massive decision to move back here and it is lovely to feel like it is paying off! Tonight The Mister and I are going to see a comedian, Rufus Hound which I am looking forward to. A perfect end to a perfect day! Well, Dad gets to be picture of the day two days in a row! It has been such a beautiful day here, warm and sunny and Mum decided that it was time to dig the barbecue out from the back of the shed and eat outdoors. This is definitely one of the best thing about being home. I know we could have done a similar sort of thing when we lived in Leeds but we spent so long at work, plus commuting, that we never seemed to have enough time. I hope this is the start of a long, hot, summer. I reckon my Dad has about 20 pots or bags of potatoes that he has planted up and we are now starting to empty out the earlies to see what has grown. Seeing them come out of the soil is like watching little jewels appear and I have to say that the potatoes are super-tasty! I am looking forward to living here when his tomatoes, beans, strawberries and raspberries fruit. There are definite benefits to living with Mum and Dad! 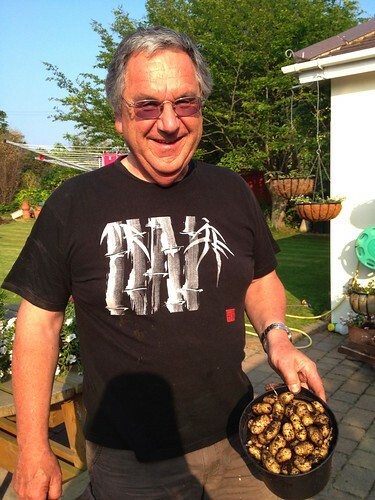 Here is Dad with his latest haul! The Mister has been off work today as he is working a night shift tonight. 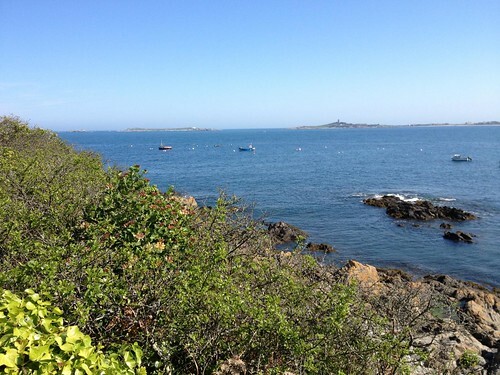 Whilst I was stuck in a stuffy hot office he went out exploring the beautiful coastline of Guernsey. This photo was taken from Pleinmont looking towards Lihou Island which is an island only accessible on foot at low tide via a causeway. Apparently not long after this the fog rolled in and apparently it was quite eerie watching it roll in from the sea.